Professional Tour Guide, Luxury Air-Conditioned Vehicles, Cotswolds, Oxford, Shakespeare's Birthplace and Warwick. Oxford college, Shakespeare's Birthplace, Warwick castle. The visit to the enchanting City of Oxford, leaves a deep impression on the visitor. The architectural contrast between the elegant spires, cobbled streets, ancient colleges and green courtyards, cannot be easily forgotten. Oxford is a very interesting and vibrant City. A vast number of Gothic and Tudor style colleges is pleasing to the eye and almost impossible to believe that so many buildings could have survived so many centuries. Above, you will find Online Booking Facilities for this tour. The trip continues through the Cotswolds with its gentle hills and old style villages. 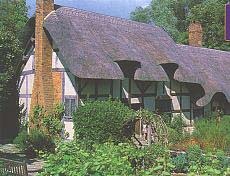 The area is steeped in history, from Castles to Manor Houses, Neolithic stones and old cottages, many with a thatched roof. Among them, Woodstock and Blenheim Palace, birthplace of Sir Winston Churchill. After this scenic drive through the enchanting small towns of the Cotswolds, (one of the most beautiful parts of the NorthWest of England), finally arriving in Stratford Upon Avon. The scenery is breathtaking. This jolly, doll-like little town, is still partly as it was in the 16th century when William Shakespeare lived there. Miraculously still preserves the character and atmosphere of an old Tudor town and a stroll along the High Street, gives the visitor that feeling of happiness “TO BE” rather than “NOT TO BE” there! Email us at: info@londontourguides.com for any additional query you may have on this tour. Following the visit to William Shakespeare's Birthplace, the tour continue to the town of Warwick for a visit to its castle which history stretches back over 900 years. In addition to sumptuous apartments, the castle includes exhibitions of past uses from: a dungeon, ghosts re-enacting, duels and bloody battles, royal splendour and beautiful gardens. Online Booking facilities for this excursion, below.